Beaufort Memorial Hospital (BMH) continues to receive prestigious designations from The Joint Commission, most recently earning the Gold Seal of Approval® for Chest Pain Certification. In April, BMH was awarded the Gold Seal of Approval and the American Heart Association/American Stroke Association’s Heart-Check mark for Advanced Certification for Primary Stroke Centers. It also received another “A” from Leapfrog Hospital Safety Grades for the fourth straight biannual assessment. Recognized nationwide as a symbol of quality, Joint Commission certification reflects an organization’s diligence in meeting certain performance standards. The independent, nonprofit organization accredits and certifies nearly 21,000 health care organizations and programs in the United States. In addition to the Chest Pain and Stroke Certifications, BMH also holds The Joint Commission’s Gold Seal of Approval Certification for Hip and Knee Replacement. To earn and maintain the Gold Seal of Approval, a hospital must undergo a rigorous on-site evaluation by a survey team every two years. BMH earned its Chest Pain Certification in May, following a review in March when Joint Commission experts evaluated compliance with national disease-specific care standards, as well as chest pain specific requirements. Clinical practice guidelines and performance measures also were assessed. Established in 2002, The Joint Commission’s Disease-Specific Care Certification evaluates clinical programs across the continuum of care and addresses three core areas: compliance with consensus-based national standards; effective use of evidence-based clinical practice guidelines to manage and optimize care; and an organized approach to performance measurement and improvement activities. A month prior to receiving the Chest Pain Certification, BMH earned The Joint Commission’s Gold Seal of Approval for Stroke Certification. A team of stroke experts visited the hospital in February to evaluate its compliance with stroke-related standards and requirements, including program management, delivery of clinical care and performance improvement. Stroke care is especially important in South Carolina, part of an 11-state region in the United States known as the “Stroke Belt.” More than 2,600 South Carolinians died from a stroke in 2016, making it the fifth leading cause of death in the state. 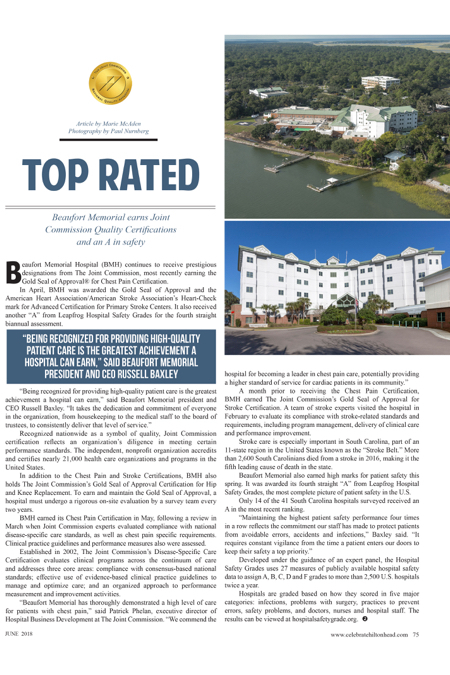 Beaufort Memorial also earned high marks for patient safety this spring. It was awarded its fourth straight “A” from Leapfrog Hospital Safety Grades, the most complete picture of patient safety in the U.S.
Only 14 of the 41 South Carolina hospitals surveyed received an A in the most recent ranking. Developed under the guidance of an expert panel, the Hospital Safety Grades uses 27 measures of publicly available hospital safety data to assign A, B, C, D and F grades to more than 2,500 U.S. hospitals twice a year. Hospitals are graded based on how they scored in five major categories: infections, problems with surgery, practices to prevent errors, safety problems, and doctors, nurses and hospital staff. The results can be viewed at hospitalsafetygrade.org.